Win! A brilliant Canon EOS 650D with lens! Want to become a photography master? Want one? Go ahead and win one, then! 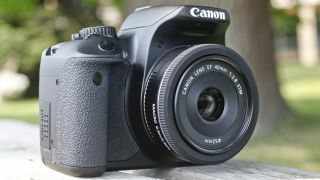 To announce the search for the UK's Gadget Guru, PriceSpy.co.uk has teamed up with Tech Radar to give away a Canon EOS 650 D, including a lens! The Canon 650D is a superbly well-rounded DSLR with plenty of features for novices and enthusiasts. Image quality and high ISO performance are both standout features of this accessible device, and the mobile touchscreen makes it a real joy to use whether you're a power user or an interested dabbler. Plus it comes with a lens, so you'll be able to get firing off those cracking shots in no time at all! On top of being able to win this stunning prize, if you'd like the chance to win a 12-month blogger scholarship, giving you free access to the latest technologies, game demos and betas, gadgets, tech expos and events, as well as showcasing your talents in 'Let's Play' pieces and video reviews, head to the Gadget Guru app on the PriceSpy UK Facebook. PriceSpy.co.uk is a price comparison site that showcase the latest prices on games, tech and gadgets, comparing over 524,000 products from over 1,637 shops. This competition is now closed. The winner is Keith Cheong.